This is another new recipe I've just finished, and it's become one of my very favorite soups - period. There's something about the warmth and complexity of the spices and seasonings in Moroccan cuisine that keeps me coming back for more... and inspires me to create new dishes using them. 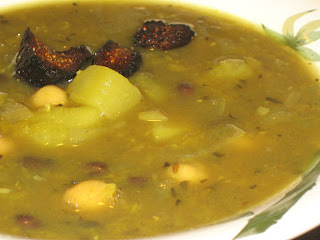 This Moroccan Bean Stew offers a heaping serving of black beans, chickpeas, and lentils, along with sweet potatoes (here I've used yellow-fleshed), and in a fragrant, intoxicating broth infused with cinnamon, cumin, coriander, ginger, fennel, garlic and more. Topped off with roasted sliced (dried) figs. We ate this soup last night and it was most satisfying. Speaking of yellow-fleshed sweet potatoes, do you use them much? Personally, I love them, and favor them in my cooking many times over the orange variety. But, are they widely available in most areas? Curious, since I find myself using them more and more in my new recipes. When will this recipe be available in a book? I never see yellow sweet potatoes in az! the soup looks and sounds perfect. so many legumes in one soup! Thanks Daniel. I'm working on the next book... as much as I can right now! I'm hoping to have more news in the spring about when I might get this book in print. Tyrah, you must give the yellow ones a try - awesome baked, put in stews, casseroles, etc. We love 'em! What a fantastic blog ! Oh, that looks lovely and yummy. Dried figs? Brilliant! The broth sounds so good. I don't think I've EVER seen yellow sweet potatoes and I love sweet potatoes. Nice blog! Perhaps you'd be interested in mine too! Right now I'm hosting a giveaway of 2 dozen homemade vegan cookies, your choice of flavor! Enter to win and spread the word. GO VEG!!! grat blog - feel free to follow my vegan blog! oh my god... FIGS as a soup garnish???!!?!!? why in the world have I never THOUGHT of that?!?!? Especially on a soup with lentils and sweet potatoes, that flavour combo would be fantastic. I buy some of the white or yellow fleshed sweet potatoes every week at my local grocery store, and I'm in a tiny rural town in NH. can't wait for the next book. Only get them very infrequently in the UK and it's never clear what you are going to get. I've made this soup twice now and love the fragrant broth and spices. instead of using only sweet potatoes, I put in a mixture of rutabagas, parsnip and carrot. yummy! Thank you for posting some of your new recipes. I can't wait till the new book is out. I can always count on the reliability of your recipes, in taste and nutrition. Best wishes as you complete this while balancing your life as a mom and wife! Way to go!